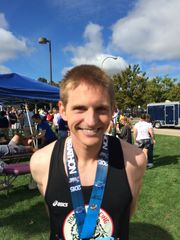 Institute of Optics graduate student and avid marathoner Kenny Goodfellow placed 10th overall in the Pittsburgh Marathon with a time of 2:38:25 and led a Rochester contingent of about 100 runners in the Boston Marathon this spring, finishing in 2 hours, 35 minutes and 28 seconds. In Boston, he placed 72nd overall and 63rd among the men. Goodfellow also took second place in the Rochester Marathon in September.